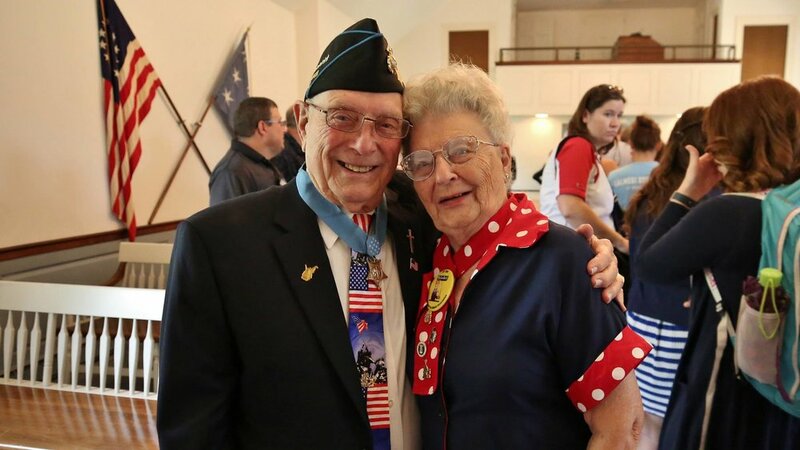 Medal of Honor recipient Woody Williams with Mae Krier. Photo Courtesy of Freedoms Foundation at Valley Forge. WYMT: One Laurel County family admires their very own "Rosie the Riveter"
Medal of Honor Recipient Woody Williams introduces Rosie the Riveter: Mae Krier before he speaks at the Freedoms Foundation at Valley Forge- Medal of Honor Legacy: WWII Graduate Teachers Program on July 18, 2018. Mae Krier addressed the teachers later in the day. Mae Krier is an original "Rosie the Riveter," helping the war effort from the home front in Seattle. She also was instrumental in creating a day for national recognition of all the Rosies, which takes place on March 21st. Recorded April 18, 2017. This powerful nonfiction video explores the role of American women during World War II.